If you’re like most of us, hearing the alarm clock trying to wake you up in the morning is the least motivating sound you’ll hear all day. The ALARMclock might change that for you by waking you up with words that are actually quite alarming. 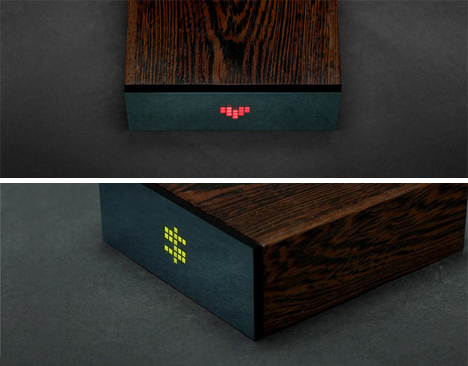 The little wood-grain clock is unassuming and even quite attractive, but it really shines when it comes time to get you out of bed in the morning. The clock gives you a reason to be motivated enough to start your day. Users can choose to hear whatever will scare them awake most effectively: their expected lifespan, their current financial situation, or the size of their social networks. 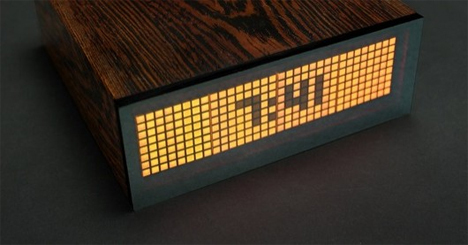 Fig, the company behind the ALARMclock, designed the display with a retro 2-bit display. Even when you get bad news that shocks you onto your feet in the wee hours of the morning, the clock looks rather cute delivering that news. The project quickly surpassed its fundraising goal on Kickstarter, earning tons of supporters who really want to wake up to sobering facts about personal and social instability.